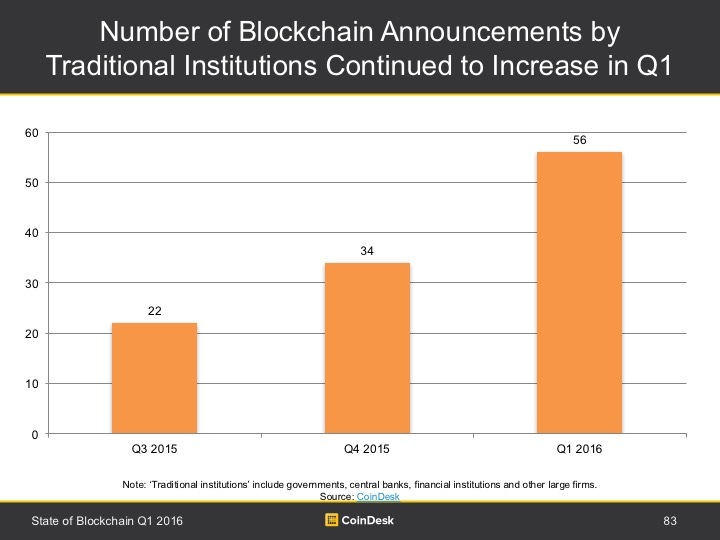 CoinDesk’s Q1 2016 State of Blockchain report summarizes key trends, data and events from the first quarter of 2016. This article highlights a few of the 100 new slides from the report, which is freely available to view in full here. For more of our quarterly and annual reports, visit CoinDesk Research. As blockchain hype begins to subside and entrepreneurs and organizations get down to the business of implementation and execution, a new debate has emerged over timing. Splitting industry observers is a key question – Are we just short distance (1-2 years) away from witnessing the radical, transformative effects of blockchain technology? Or is five to 10 years a more realistic timeframe before blockchain technology fully matures and achieves wide adoption? Nearly two-and-a-half years have now passed since Marc Andreessen penned a widely referenced New York Times op-ed about how bitcoin reminded him of the Internet circa 1993. His forecast suggested that it would be only a few short years before the blockchain-equivalent of Web 1.0 world-beating companies like Cisco would emerge. In contrast, a string of voices, ranging from author and consultant Chris Skinner to financial institutions such as Morgan Stanley, have suggested that blockchain maturity and adoption is likely to take much longer than Andreessen’s forecast. In other words (and to stay with the Internet analogy), the skeptics would say blockchain adoption is actually closer to 1970s-80s Internet time, when foundational protocols like TCP/IP were invented, rather early-1990s Internet time. Who’s correct in this debate remains to be seen, but the stakes are incredibly high for an industry with over $1bn in venture capital investment. 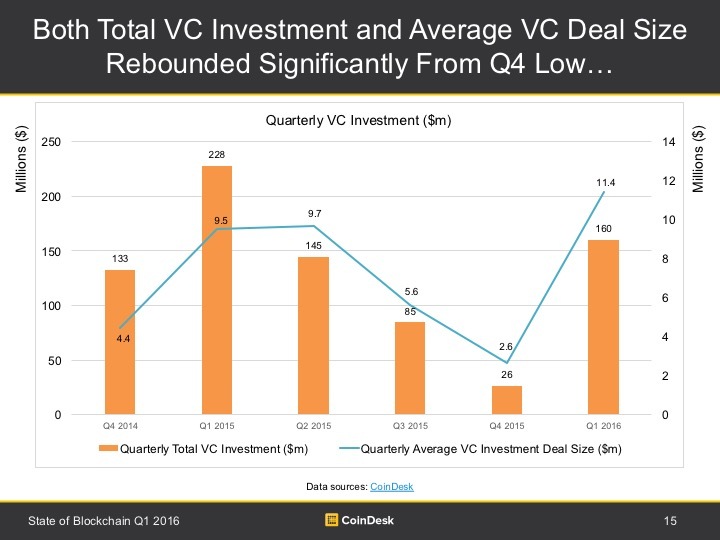 As of Q1 2016, total venture capital investment in bitcoin and blockchain startups now exceeds $1.1bn. Perhaps more importantly, Q1 saw a sharp reversal in the multi-quarter downward investment trend, with both total investment and average deal size rebounding in the early months of the new year (Slide 15). These investment results for the bitcoin and blockchain industry are all the more impressive given the ongoing softening observed in overall venture investment. The strong investment interest that is being shown in blockchain tech is largely responsible for the industry bucking this trend. The major industry story for 2015 was the increasing focus on the underlying technology of the bitcoin currency, which is commonly referred to as blockchain or distributed ledger technology (DLT). This trend carried over into the first quarter of 2016 with a further increase in the number of traditional institutions that announced some form of blockchain initiative (Slide 83). As we have noted, however, there is much confusion over the term “blockchain”, and this confusion has led to frustration for both those new to the technology as well as amongst more fluent observers who will often see different terms used to express the same basic idea or principle. In the report, we have therefore chosen to devote several slides to presenting a taxonomy and conceptual framework that will hopefully help clarify some of the basic blockchain differences and similarities. To begin, we differentiate between bitcoin startups, which are defined as any cryptocurrency startup that focuses on payments, exchange trading, remittances or any other ‘currency’ activity, and blockchain startups, which focus on ‘non-currency’ activities such as securities settlement, property title, asset provenance, etc. (hybrid startups do both) (Slide 19). 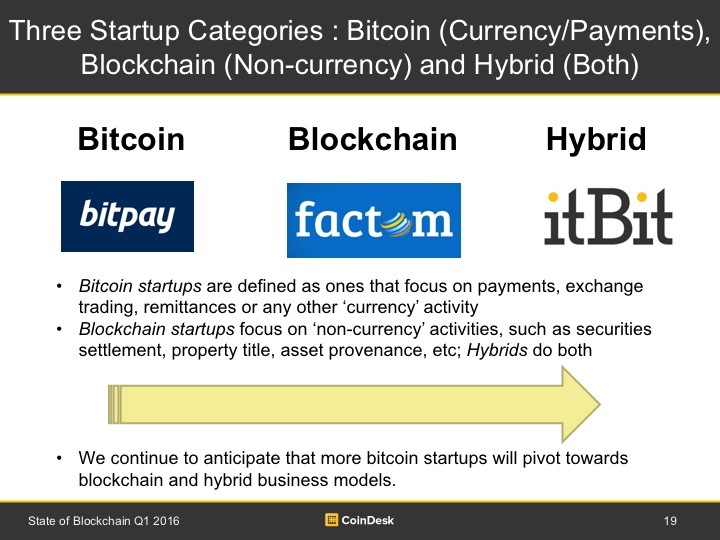 There are now four times as many blockchain/hybrid startups than there were last year, and the first quarter of 2016 was the first time blockchain and hybrid startups raised more money than bitcoin startups (Slide 21). 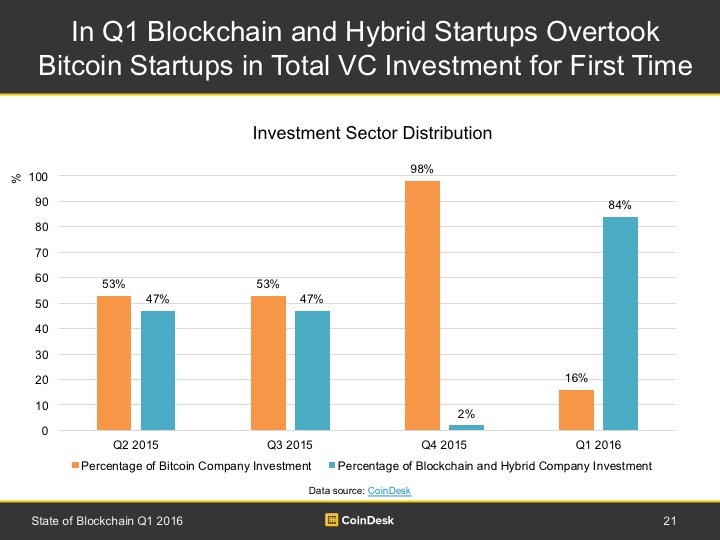 It is also worth noting that twice as many blockchain/hybrid startup investment rounds were completed in Q1 as were completed for bitcoin startups. In short, the industry’s pivot toward blockchain is well underway. Blockchain technology in some ways resembles a Rorschach test, a psychoanalytical tool developed in the 1920s where a person describes what a symmetrical series of ink blots suggests or resembles from their own perspective. When looking at the same ink-blot figure, different people will often report seeing very different things. Similarly, when some people look at blockchain technology they see an open, permissionless system for achieving consensus and maintaining a shared public ledger. In contrast, when others look at blockchain technology they see a tool for providing a permissioned, semi- or fully-private access database. While considerable debate has emerged over the merits and prospects of public (or open) and private (or permissioned) blockchains (Slide 7), the ability and flexibility of blockchain technology to serve many different purposes is one of its most powerful qualities. What has been less frequently discussed are the differences between blockchain platforms and blockchain software. Blockchain platforms are similar to other technology platforms, like iOS, Facebook, etc, in that they enable outside developers to build applications on top of the platform, typically through open APIs, software developer toolkits (SDKs) and standardized protocols. 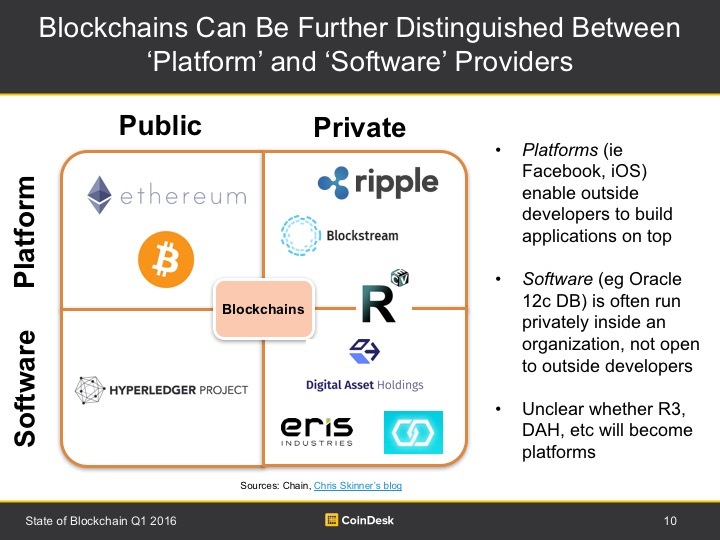 Ethereum and bitcoin are representative of public blockchain platforms, while companies such as Ripple and Blockstream are representative of private blockchain platforms (Slide 10). In contrast, blockchain software providers more closely resemble companies like Oracle, which provide software packages that are often designed to be used internally or have more restrictive parameters to prevent outside developer access. The blockchain company Chain has been typically held up as an example of a private blockchain software provider, although the company’s recent announcement that it had built a permissioned protocol in collaboration with 10 firms suggests it is attempting to transition into a platform. While the conventional wisdom among Silicon Valley venture capitalists and others is that businesses that can successfully become platforms represent the ideal investment, the purpose of distinguishing between blockchain platforms and software providers is not to cast judgment on the merits of the various blockchain business models. Indeed, it is likely that significant success can be achieved in any of the four platform/software quadrants. Instead, the distinction drawn in Slide 10 allows us to observe where blockchain initiatives are concentrating. The two most crowded areas of the blockchain matrix appear to be the public platform and private software quadrants. For example, there are literally hundreds of public blockchains, represented by altcoins. It should further be noted that the above depiction is not static. While private blockchain initiatives like R3 and Digital Asset Holdings may provide stand-alone software to their partners, both have achieved early critical mass and may ultimately become platforms. Some early geographic areas of concentration can be observed in the distribution of blockchain venture investment and partnering. As with bitcoin investment, the US continues to dominate blockchain investment, with the total amount invested to date in the US roughly split 50/50 between bitcoin and blockchain and hybrid startups. 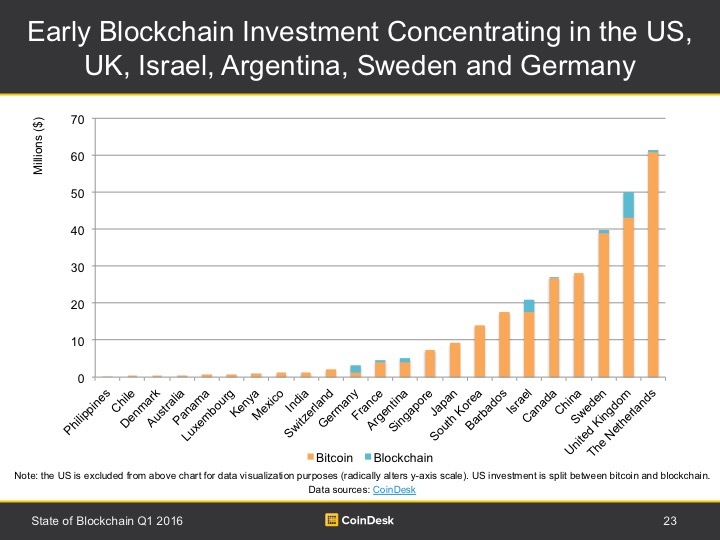 Other countries showing early leadership in attracting blockchain investment include the UK, Israel, Sweden, Germany and Argentina, which is the lone developing economy to have attracted any significant blockchain venture investment (Slide 17). 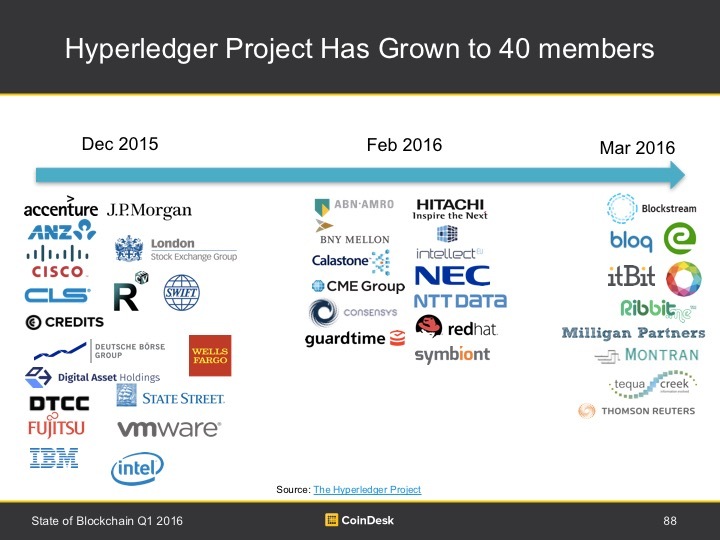 In Q4 2015 blockchain news was largely dominated by R3CEV, which to date has attracted over 40 major banks and financial institutions as partners. However, R3’s early lead in building an impressive consortium of systemically-important financial institutions does not appear to have had a negative impact on the ability of other blockchain initiatives, such as the Hyperledger Project and Digital Asset Holdings, to attract a similarly impressive group of partners and investors (Slide 88). Akin to 2015 being the year of blockchain, Q1 2016 was arguably Ethereum’s breakthrough quarter in terms of broader awareness. In contrast to bitcoin, DLT’s much touted ‘killer app’ – smart contracts – run natively on Ethereum. This feature, combined with an absence of the stagnation witnessed in bitcoin development (more on this later), has resulted in a number of high-profile wins for the Ethereum community, including integration of certain providers into Microsoft’s Azure platform and many high-profile trials of Ethereum by UBS, R3 et al. 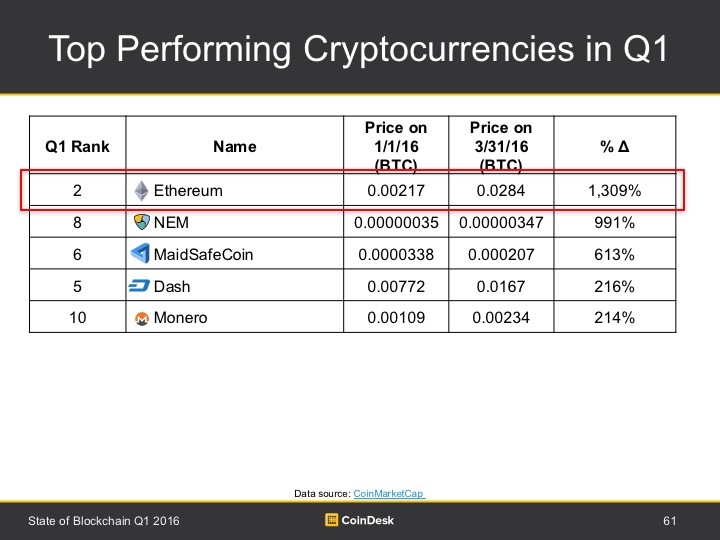 In response to these positive developments, the value of ether (Ethereum’s native token) rocketed upwards against bitcoin by over 1,300% in Q1 (Slide 61). 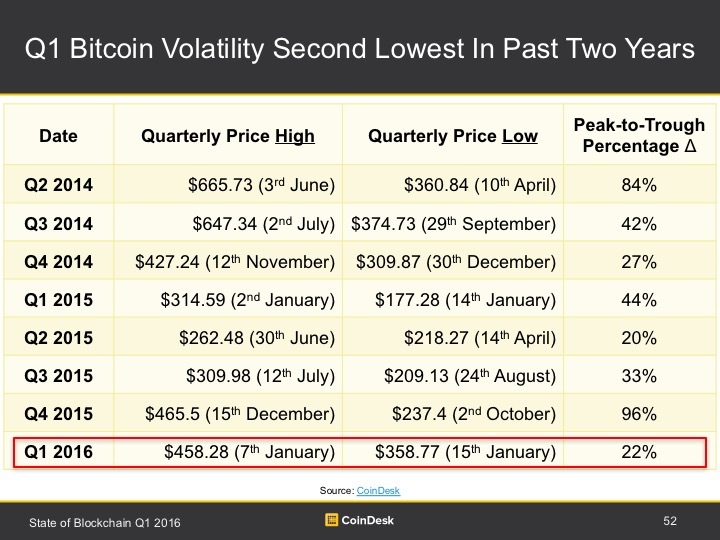 On a peak-to-trough basis, bitcoin’s price had one of its least volatile quarters in the past two years (Slide 52). However, as discussed previously, lower bitcoin price volatility is not necessarily a positive trait. Bitcoin was the top performing currency in 2015, but so far in 2016 has lagged other currencies. The price of bitcoin has also lagged behind a basket of publicly traded FinTech companies while showing relatively moderate-to-low price correlation with FinTech stocks (0.38). Positive bitcoin price developments in Q1 include progress on scaling transaction throughput and the approaching July 2016 halving of the new block mining reward. However, these positives have been countered by clear enthusiasm shown for bitcoin alternatives (namely Ethereum and non-currency uses of blockchain technology), a relatively stable macroeconomic environment, and (most importantly) the lack of a mainstream bitcoin “killer app”. Overall, bitcoin’s price struggled to achieve much momentum in either direction amid a mixture of bullish and bearish forces. Ethereum’s recent progress amid bitcoin’s ongoing political challenges highlights the possible importance of founders to open-source innovation and governance. Satoshi Nakomoto’s transition many years ago to “absentee landlord” status (Satoshi is estimated to own approximately 1m BTC) has long been viewed positively as it created space for the emergence of other talented software developers and entrepreneurs who could bring fresh ideas to bitcoin and feel a sense of ownership in the project. Satoshi’s disappearance also lent bitcoin a degree of mystique that captured the imagination and generated unprecedented (for an alternative currency, at least) media interest. 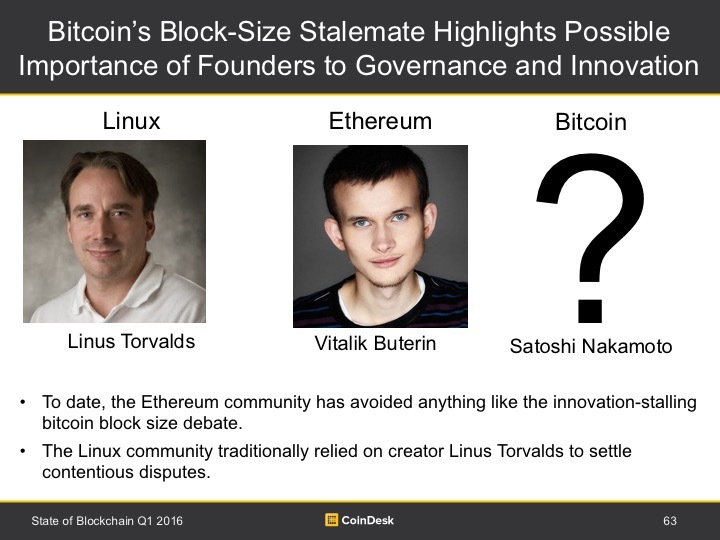 However, it has not been lost on observers that other open-source initiatives whose founders have remained active have not suffered anything like bitcoin’s current political gridlock (Slide 63). Indeed, the recent speculation and debate surrounding Craig Wright’s role in the creation of bitcoin has been accompanied by statements from Craig and others over the current block size debate. 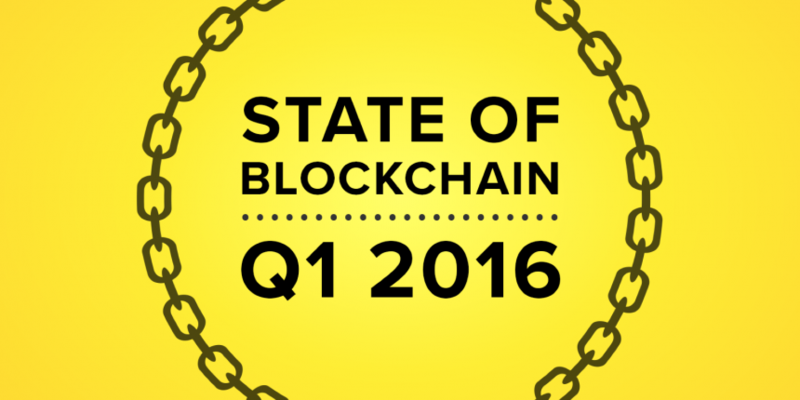 View the full State of Blockchain 2016 Q1 Report. Enjoy CoinDesk? Help us improve by taking a quick survey.